Around the world, civil society organisations face increasing restrictions on how they organise, function, and express their views. The ACT Alliance and many other networks continue to document this serious trend, including the strategies that organisations have adopted to continue their important work. The Middle East Region is no exception to this trend. 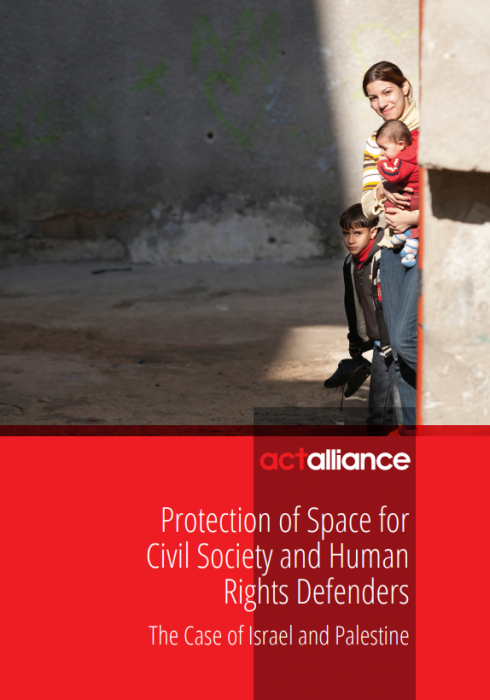 ACT Alliance’s latest study published today “The Protection of Space for Civil Society and Human Rights Defenders-The Case of Israel and Palestine” shows how both Palestinian and Israeli organisations and journalists face mounting hurdles, legal restrictions, stigmatisation and danger in their ongoing work on poverty alleviation, humanitarian assistance and combatting injustice in the Occupied Palestinian Territories. The report also warns of the impact that the silencing of these voices is likely to have on a just and sustainable peace in the region and why accountability to international human rights and humanitarian law breaches remain a central concern in this regard. The report also reflects on the causes of these measures and how the political contexts in Israel and within the Palestinian Authority have contributed to the harshness of these measures: measures that are now varied and intensifying. These measures include the now well-documented legal and administrative restrictions (e.g. the NGO Transparency Law in Israel and the Cyber Crime Law by the Palestinian Authority), administrative measures, stigmatisation, detention and even death threats. The report also references a number of actions being taken domestically and internationally to influence access to financing and the reputation and operation of legitimate civil society organisations and actions. There is an urgency in the call for action in this report: a call primarily directed at EU member states and other state actors. ACT Alliance calls on these states to stand firm on their foundational values and to engage the Palestinian Authority and the State of Israel on laws, policies and practices that are not in keeping with internationally recognised human rights and humanitarian law standards. Importantly, the report calls on these actors to stand alongside civil society actors who, at great risk to their organisations and themselves, continue to work to hold their governments to account to internationally recognised human rights and humanitarian law standards. ACT Alliance hopes that this urgent call will be heard and that action will be taken.